The rare 1901 edition of The Tale of Peter Rabbit Photo: Courtesy of Dreweatts & Bloomsbury Auctions. A first edition of The Tale of Peter Rabbit - one of the most well-known children's books - is set to go on auction later today. The book, which features 41 full-page line drawings, was privately printed by Beatrix Potter in 1901 after several publishers turned her down, and is expected to fetch up to £35,000. The Lake District landscapes inspired Beartix Potter during the 21 years her family holidayed there. The sale coincides with her 150th birthday. The Story of Miss Moppet is also on sale Credit: Courtesy of Dreweatts & Bloomsbury Auctions. Other highlights of the sale of Beatrix Potter memorabilia include an original watercolour design for The Story of Miss Moppet, which was autographed by the author and includes her notes. The drawing of the mouse was created in 1906, and is expected to fetch up to £12,000. Two mice in a coconut Credit: Courtesy of Dreweatts & Bloomsbury Auctions. Also up for sale is an illustration of two mice in a coconut created for a Christmas card before Potter made her name as an author. Many of the 62 lots come from the John Cawood Collection, which has been amassed by the collector since 1972. The sale of the items will take place at Dreweatts & Bloomsbury Auctions, and marks the 150th anniversary of Beatrix Potter's birth. 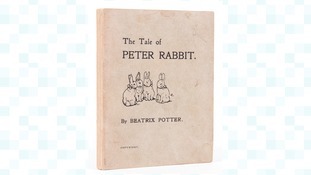 A first edition copy of Beatrix Potter's The Tale of Peter Rabbit has sold at auction for £43,400.